On the way back to Tane from Mie-ken, I accidentally stayed on one train too long, missing my transfer point. Where was the next stop? About fifteen minutes down the line at tiny mountain town with the smallest train “station” I’d ever seen. Lacking a vending machine, a proper bathroom, and anyone on duty, it sported benches and a box to collect fares. Spoken Japanese is remaining difficult: the parts of this language that I can actually use I learned from the Pimsleur CDs from the Marin County Library. Repetition, constant drilling, and structure helped tremendously. Conjugating anything, whether verbs or adjectives, on my own is still really hard. Particles remain a bit of a mystery. Anyone want to mail me a workbook or Audible credits so I can download the rest of the Pimsleur lessons? However, reading Japanese, especially kanji, is a little easier now that I’ve discovered two features of the Kotoba! iPhone app. Not only does Kotoba! have a Japanese-English dictionary that accepts input in kana or Roman characters; not only does it work without an Internet connection (super important); not only does it show you stroke order for kanji… Kotoba! 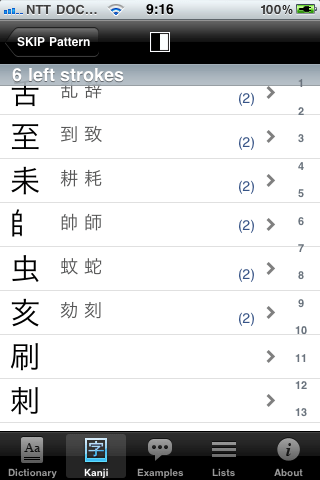 lets you look up kanji without knowing how it’s read. First off, the SKIP classification is amazing: it lets you look up kanji based on shape and stroke, which is incredibly useful for me. Let’s take 蚊, mosquito, which looks like two figures side-by-side. With SKIP, I select Left-Right pattern, then guess at the number of strokes in the leftmost figure (six).